We have fallen for fall – the colors, scents and even the chill in the air that makes you pick up the needles and hooks after the summer hiatus. 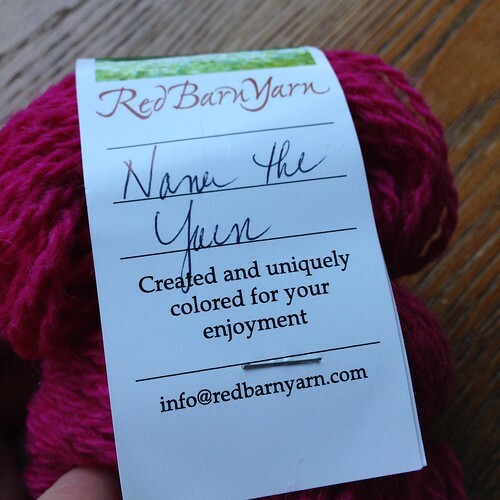 Red Barn Yarn® is ready to be the yarn in your next project! Autumn Inspirations immediately comes to mind. This pattern is available for you to purchase on Ravelry and add directly to your library. Memories of growing up in Ohio, and watching the Maple leaves turn each year was the genesis for this design. The shawl uses one Uniquity and coordinating colors: Plum Rosa, Liquid Amber, and Coral Bells on the Red Barn Yarn® Worsted base. Part of the fun of starting a new project is selecting the colors! These patterns are not only fun to knit or crochet, but also allow for creating a truly one-of-a-kind item! The Fall 2014 Love of Knitting included the Letterman Scarf in Red Barn Yarn® Powder River. On Ravelry, we spotted the Crystalline Cowl project knit by angrymeerkat with Red Barn Yarn® Chunky Sparkle. What a great use for any of the variegated colorways! The Mountains Cowl, a free crochet pattern available via Ravelry download, would also nicely showcase your favorite base and colorway(s) of Red Barn Yarn® Worsted. Please enjoy shopping through our website. If you have any questions or need more information, please call Catherine 626-221-8817. On RedBarnYarn.com shop our entire collection of bases and colorways for the yarn of your heart’s desire, add it to your cart and check out via PayPal. Though the weather outside may still feel like summer, the magazines that come to the mail box and the popular patterns on Ravelry are showing the early signs that fall is coming. Red Barn Yarn® would like to take this opportunity to share with you a few patterns that we think would look particularly nice in our yarns. Accessories are a great choice to work on this time of year. If the weather is still hot they do not create a large pile of yarn on your lap and they work up quickly! The Age of Brass and Steam shawl and Autumn in the Ozarks are each currently available on Ravelry as a free download. Red Barn Yarn® Powder River is a perfect dk-weight choice for these patterns and one skein of yarn (with 260 yards in a skein) would be enough to make a small shawl or the fingerless mitts! Sweater weather is sure to be here before you know it, so if you prefer to start on a sweater here are a few we think are fantastic! Pepper, Salt and Chili is a easy-to-knit seamless top down sweater. The semi-solid grey with the pop of red is wonderful; we could see this in Red Barn Yarn® Worsted! The Lady Sunnyside is another choice for our Worsted in a simple yet detailed and very classy cardigan. The Fretwork Pullover, in the new Vogue Knitting, took our breath away with the cablework. This design calls for a dk yarn – Red Barn Yarn® Powder River maybe or our Raw Wool & Silk would create a showstopper of a sweater. How are you knitting your way through the end of summer and start of fall? 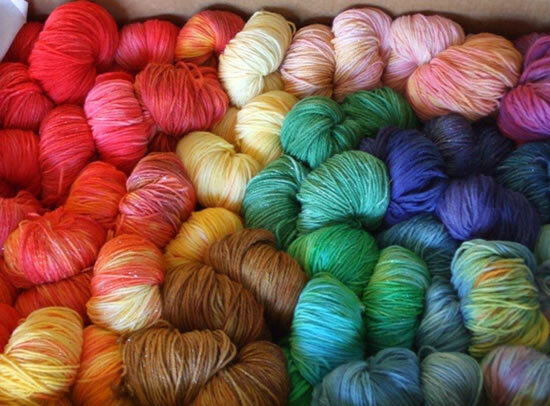 Let us know on our Facebook page, share your Red Barn Yarn® projects with us on Ravelry or leave us a comment here!